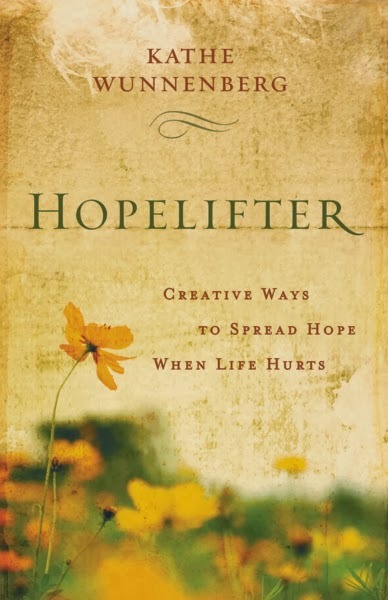 What is a "hope-lifter?" It is someone who spreads hope to those who are feeling hopeless. He/she "lifts up" the hurting person when they are down by providing love and support where needed. How do we become hope-lifters? That's what the book HOPELIFTER, by Kathe Wunnenberg, is all about. Then, the book also includes a discussion guide for group study, verses of hope to share with others, and helpful websites about hope/caring to look up. In a world where there is so much discouragement and hope seems to be lost, we all need to be thinking of ways to strengthen and encourage each other. This book CAN inspire you in this area. However, the book wasn't exactly what I was expecting. If you are looking for a book that gives specific ideas/examples of how to encourage others undergoing difficult situations, this book is probably not it. It seems to focus more on "stories" and on the author's personal experiences than it does on giving practical "how-to" advice. Still, not a bad book! It just wasn't what I was expecting. Disclosure: I received this book free from the publisher through the BookSneeze.com book review bloggers program. I was not required to write a positive review, and the opinions I have expressed are my own.